I was inspired by a lesson in the Online Card Classes Stretch Your Stamps 2 class to play with a background stamp and Perfect Pearls. I stamped the lovely background image with Perfect Medium and then applied Perfect Pearls to make an elegant sheen on the dark brown cardstock. I covered the die cut butterfly with gold embossing powder and heat set it. I wanted to repeat a little of the gold used in the background to tie the butterfly focal point to the background. For the sentiment, I used the die cut words, adhered them to a fishtail-cut flag, and covered it all with Glossy Accents to bring on a little more shine. Thanks for visiting. 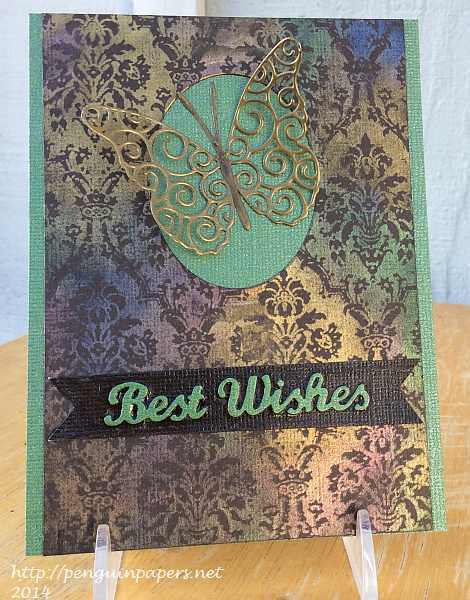 This entry was posted on Tuesday, August 5th, 2014 at 10:04 pm	and tagged with butterflies, cardmaking, die cuts, embossing, memory box, Ranger, spellbinders, Stamper's Anonymous, tim holtz and posted in General Cards, Online Card Classes. You can follow any responses to this entry through the RSS 2.0 feed.